Android is one of the most famous and most used mobile operating system around the world. This is not because of marketing but more because of so many options available when it comes to Android. You can find phones running on Android starting from just a few couple bucks and they go up to luxurious phones made by Lamborghini. You will basically find a plethora of Android devices around the world. Android is an OS for a smartphone and hence you expect it to be smart enough to do some basic tasks automatically. In this post I will tell you how to backup Android device (smartphone / tablet) contacts. Android Open Source Project is developed and supported by Google. The purest and vanilla form of Android comes with all the important Google services like Play Store, Play Magazines, Play Movies & TV, Google Play Services, all integrated in it by default. Now since Google can be considered a suite of important and useful web apps that you can access on the web, you can also expect the iteration of same features in Android but they are implemented inside the system. Google lets you store and sync your contacts across the devices using cloud and it is really easy to setup. 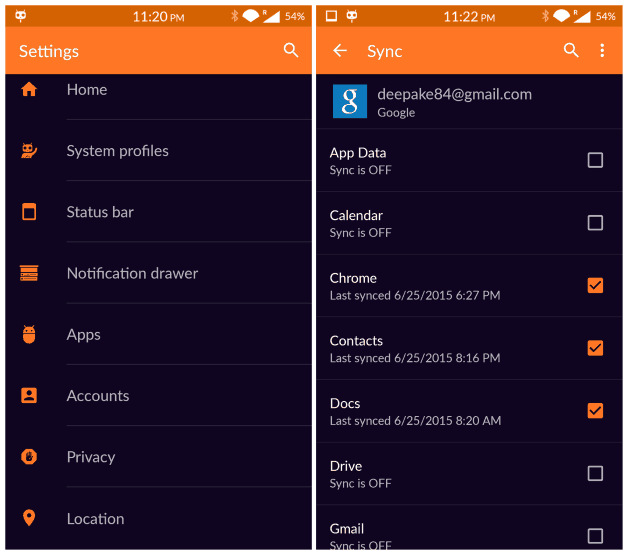 Just follow the procedure we have shown below to setup Google Contacts Sync on Android. Here is the procedure to backup Android contacts using Google Contacts Sync. Open Settings on your Android device. Follow this path: Settings > Accounts. Now if you don’t have a Google account added or you haven’t signed up for a Google account yet, just tap on Add account. After you have added the account, go back to Settings > Accounts > Google. Now choose the account you want to sync your contacts to. Now make sure the sync option for Contacts is turned on. This is it. This is all you need to do in order to back up your Contacts on your Android device. 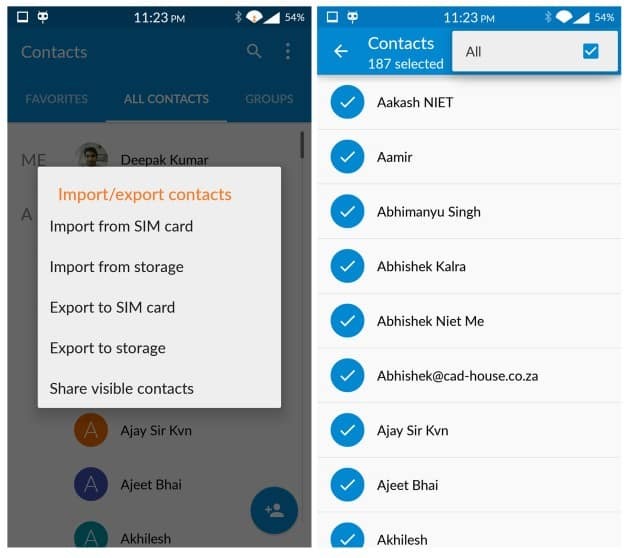 Now whenever you login to your account on an Android device, you will see that the contacts will be synced automatically on the device if the sync is on. This is not only a great way to back up your contacts, but you just have to log in to your account again in order to restore them and that is all. 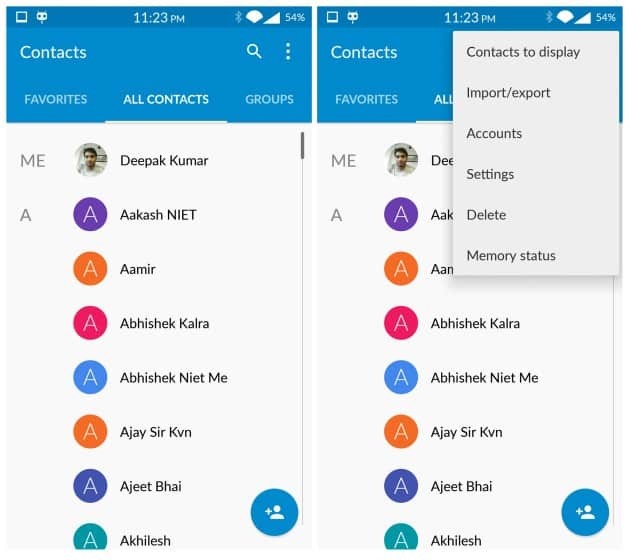 Android comes with a contacts app by default which you can use to manage your contacts etc. Open the Contacts app on your Android phone and now go to the options menu. You will now see an option to Import/Export Contacts. Now choose Export Contacts to Storage. Choose All Contacts from the menu and tap the Check button. Now you will be alerted that the contacts will be saved in the form of VCF files in your storage that you can use to restore the contacts later. So this was a small post in which we told you how you can easily back up your Android contacts using two methods. You can use either of the methods I mentioned above to back up your contacts as both of them work without any hitch. Deepak Kumar is an engineer by nature and a tech lover by choice. He loves to write about new smartphones and technology. A Facebook addict, you can easily contact him on Facebook. Explained: What Is A Custom ROM?